I’m bad to my stomach but good to Cambodia. About every six months, when we’re in Phnom Penh, I eat pizza. I love pizza, so it’s a good thing a good pizza is not so common where we live in Thailand or I’d completely ruin my gluten-free diet. (Unlike many people with gluten problems, I’m fortunate in that my symptoms are not so bad. I can cheat. Two days later, I get a bloated belly that gurgles all night and I can’t sleep. But many people have it much worse.) Here in Phnom Penh, some pizza is worth the cheating (such as last night’s Marinara with shrimp, fish, crab, tomato sauce, cheese and oregano). The Veiyo Tonle has always been a favorite choice: 39 varieties of creative pizza, yes; but also down-home Khmer food so evocative of the herbs and spices used daily in countryside meals. Try the pickled lime soup with chicken. You will never forget the tart, pungent flavor of pickled lime. But more than that: At the Veiyo Tonle, you can eat well, sip your drink and feel confident in what you’re doing. Your money will go toward the orphanage that Neth Lay established to help disadvantaged Khmer kids. When you eat at Veiyo Tonle, you’re supporting a nonprofit Khmer-operated business and you’re improving the lives of Cambodian orphans. Go there on a Saturday or Monday night, and watch those orphans perform traditional Khmer dance. It’s more than enough to make you eat pizza again and again. 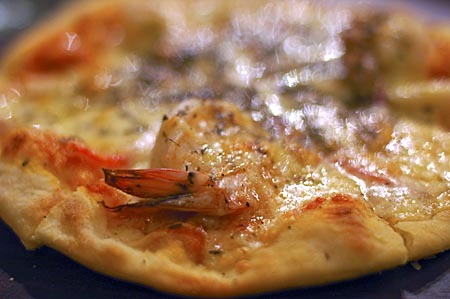 That sounds like a yummy pizza, I’ve never had one with that many varieties of seafood on it. We had pizza last night too! Ours was with homemade pesto, fresh mozzarella, bell pepper, carmelized onions, sausage, sliced green tomatoes and romano cheese. Tasty too! Sounds like you have quite the cause to eat it for too, the orphanage. We only had our stomachs. Cheers to you in Cambodia!